Is Google Search Advertising Deceptive? The ACCC is also alleging that Google, by causing the Kloster Ford and Charlestown Toyota links to be published on its website, engaged in misleading and deceptive conduct in breach of section 52 of the Act. Further, the ACCC is alleging that Google, by failing to adequately distinguish sponsored links from “organic” search results, has engaged and continues to engage in misleading and deceptive conduct in breach of section 52 of the Act. The reference to two car dealers regards a third company, Trading Post, which offers listing services. Trading Post bought ads in Google AdWords that used the dealers’ names in the titles, but sent people who clicked on the ad to the Trading Post site. The ACCC site also details another instance where Trading Post bought the keyword “Stickybeek,” a listing site that clearly is a competitor, and directed the ad to the Trading Post site. There’s a critical distinction that needs to be made here. I can only assume that Trading Post was using the car dealers’ names without the car dealers’ consent, thus stealing traffic away from their sites. To create an ad that leads users to believe they are visiting one site but instead sends them to another is utterly deceptive, full stop. 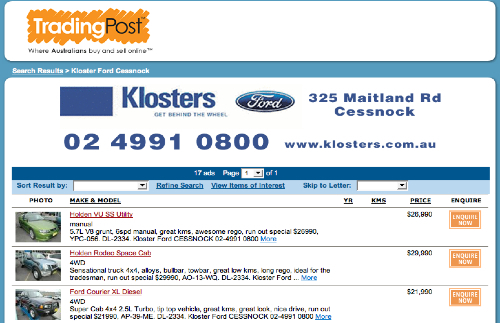 But this is opposed to working with the car dealers to drive search traffic to the the dealers’ listings page on Trading Post — which I think is perfectly legitimate and something that a lot of classified sites, including newspapers, are doing. The big issue for Google is that this is just one example of what are probably thousands (or tens or hundreds of thousands) of instances where an AdWords ad is deceiving users in one way or another. Google AdWords has scaled so beautifully as a money making machine because the self-serve system requires minimal resources to manage, and much of that management is automated. But if Google had to vet every ad for deception and other malfeasance in a way that required human judgment, it would be a logistical, cost-ballooning nightmare. A vexing aspect of this problem is that deceptive advertising exists along a continuum, with a lot of gray area in the middle — Google would sooner give away its algorithm than have to manufacture some standard of deception and arbitrate which of the millions of ads in its system are over the line. Google, of course, claims that “user experience” is its north star, and deceptive ads certainly make for a bad user experience. Google has in fact cracked down on some aspects of user manipulation, such AdSense arbitrage pages where someone uses an AdWords ad to send users to a page full of AdSense ads that pay more than the original AdWords ad costs. But there is so much gaming and manipulation of their system going on that there is no way Google can stop it all — and they have a financial incentive NOT to stop, since they make money off of every instance. Google was able to let a lot of this advertising malfeasance get swept under the rug — until now. If the Australian government forces Google to police its ads, it could strike a harsh blow to Google’s business in that country — and other countries, especially in Europe, would be tempted to follow suit. But it gets worse. The Australian government also contends that the way Google presents ads on its search results, labeled only with a “Sponsored Links” in small text, is deceptive. Common sense tells you that there’s no way Google could make $10 billion without some people clicking on sponsored links because they mistook them for organic links. For example, the ads that appear right above the organic results in the yellow box are labeled “Sponsored Links,” but on high resolution wide screens, which are common on most computers, that label appears far to the right, such that a user focused on the content on the left could easily fail to notice it. Google and others that have adopted this format walk a very fine line between being inadvertently misleading users and outright deceiving them. The colored background is a fairly strong cue, and I’d guess the majority of users can distinguish the ads from the organic results. But what if 10% of users can’t? Or 1%? Or 0.01%? How many deceptions are too many? Of course, all advertising walks this fine line. You could also ask how many people turn to a magazine or newspaper ad, hear a radio ad, or see a TV ad and don’t realize that they’re seeing an ad? It’s probably a pretty small number, but I’m sure it’s not zero. It’s very interesting to note that Yahoo has bought the keyword “Google search advertising” — this is not deceptive along the lines of what Trading Post did, i.e. 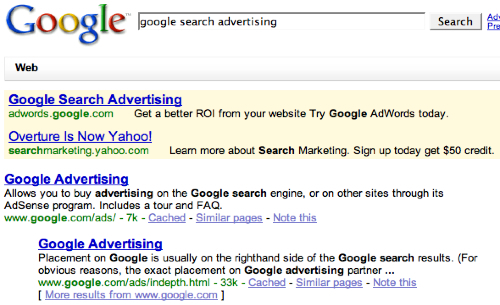 if the Yahoo ad used the word “Google” in the title of the ad. But it’s still playing off of a competitor’s brand name — something that the open AdWords system enables and does not in any way discourage. It’s striking that the Australian government chose to go to the mat with Google not just over policing specific instances of outright deceptive ads but also over Google’s entire search advertising format. Imagine the U.S. Justice Department bringing legal action against a TV station or a newspaper for running an ad with false claims — and then failing to overtly label the ad as ad, something that traditional media ad formats typically don’t do. The U.S. government gave Microsoft a beating with the antitrust lawsuit that stretched over many years, which cost Microsoft many millions and much headache to defend. It certainly didn’t put Microsoft out of business, but the effect on Microsoft’s business long term couldn’t have been positive. It’s not hard to imagine Australia or some other government putting Google up against a legal challenge that similarly cannot be easily dismissed. SPONSOR MESSAGE: NXTbook Media - What Is a “Digital Edition”?